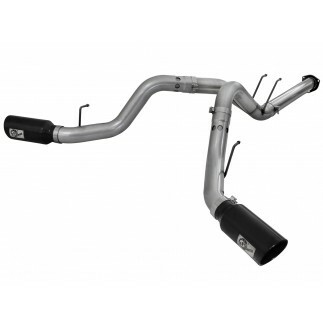 This ATLAS Down-pipe exhaust system is 100% hand MIG-welded and Constructed from 4" mandrel-bent aluminized steel tubing for maximum flow. 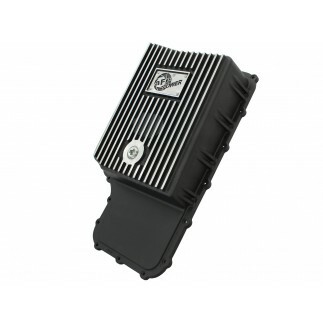 The smooth transition bends allow for low turbulence, increasing horsepower, torque and lowering EGT's. A mitered merge collector is also incorporated to eliminate dead space that can cause turbulence and hinder flow. 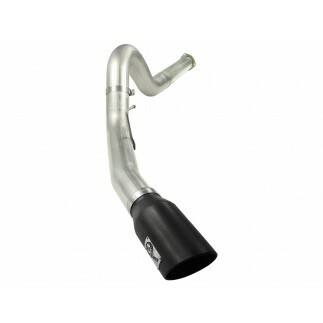 A free-flowing aluminized steel muffler is used to absorb high pitch tones producing a powerful sound and unleashing all available horsepower and torque out of your rig. This system uses all factory mounting locations providing stability and hassle-free installation. Includes OE-style bayonet hangers which are used to maintain a stable pipe location during high vibration and high heat conditions. The bayonet tip holds the hanger bushing in place for an OE-style fit that does not change with time. Finishing off the exhaust are dual side exit 6" stainless steel clamp-on tips with a high luster polished finish. A unique laser-cut aFe Power logo plate is riveted on for an aggressive style.